You can install the Zoom Scheduler add-in to your Outlook Web Email (OWA). Log in to your Outlook web app (OWA). Search for Zoom Scheduler and click Add. 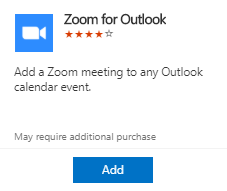 The Zoom Scheduler add-in will now be available in Outlook. Click the Zoom icon in the top toolbar. You will see the sidebar open, prompting for your Zoom credentials. Select your desired video, audio and meeting settings. Click Add Zoom Meeting to add Zoom join options to the meeting. 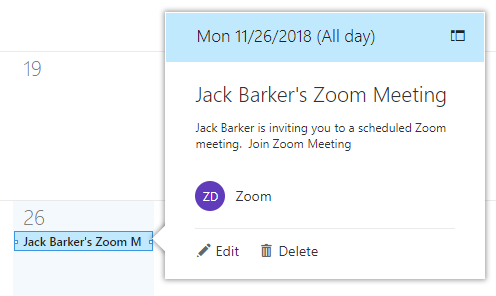 Open your Outlook Web Calendar, click on a Zoom meeting, and click Edit.